Since the beginning of mankind comets have amazed and mystified us. Over the past twenty years, our solar system system has witnessed some notable examples. 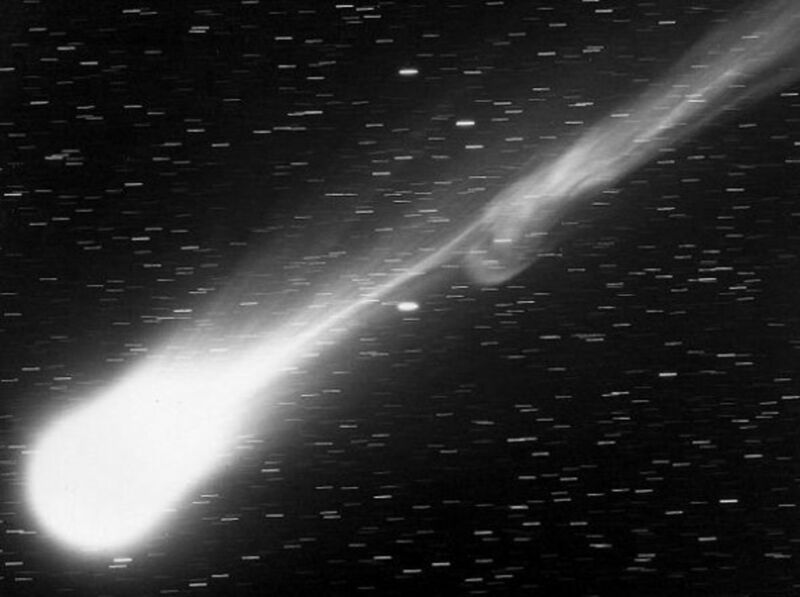 These comets have been quite the spectacle for both astronomers and amateur stargazers alike. This five-page lens touches on some of the more important comets that have visited us over the past two decades. I can vividly remember observing the Hale Bopp Comet back in 1997. What an amazing thing it was to see. The comet was perhaps the most observed comet ever, having been visible to the naked eye for a period of 18 months. Coincidentally, it was also one of the brightest to have passed near our planet in recent years. 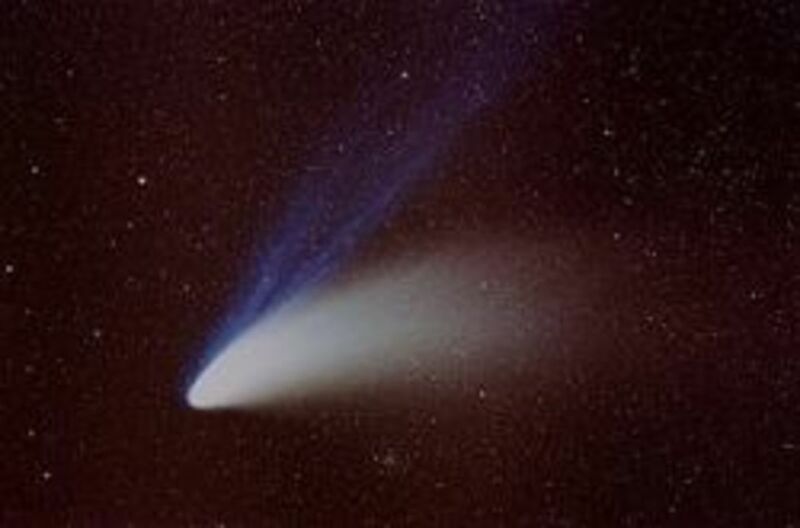 The 1997 Hale-Bopp Comet was one of the brightest comets to reach the inner solar system in history. The Hale-Bopp Comet, also known as the Great Comet of 1997, was discovered separately by two amateur astronomers; Alan Hale, in New Mexico, and Thomas Bopp, located in Arizona, on July 23, 1995. The comet's extreme brightness was notable, as it was able to be seen by the naked eye for a record 18 months, more than twice as long as the previous record holder, the Great Comet of 1811. During its visit, the Hale-Bopp Comet provided a massive amount of scientific information. NASA launched an unprecedented investigation of the comet, spearheaded by it's two most advanced observatories- the International Ultraviolet Explorer and the Hubble Space Telescope. 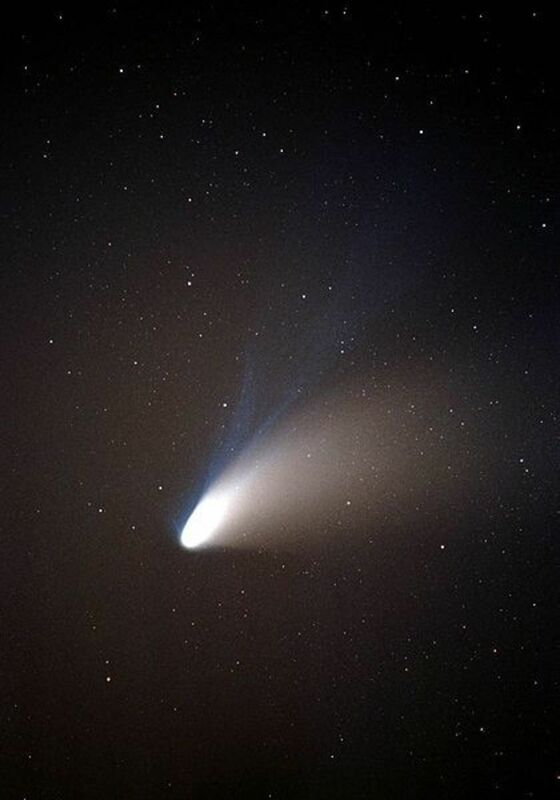 Most astronomers thought that Hale-Bopp had a sizable nucleus up to 25 miles in diameter, while the average comet has a nucleus of about three or four miles in diameter or smaller. It is theorized that the asteroid, (or possibly comet), that struck Earth and led to the extinction of the dinosaurs around 65 million years ago, was roughly seven or eight miles in diameter. Hale-Bopp was also notable because of it's properties. Scientists were shocked to discover that different types of ices that make up the comet's nucleus are somehow isolated from each other. The scientists also discovered that the comet had a third tail. While it is widely known that comets generally have 2 types of tails, dust and gas, this comet also had a sodium tail. This extremely long tail was found to contain neutral atoms. It was found to be located between the gas tail, which pointed away from the Sun, and the dust tail, which followed the comet's trajectory. Additionally, the Hale-Bopp Comet was also found to carry a huge amount of deuterium and argon. Argon had never before been discovered on any other comet. Did you observe Hale-Bopp in '97? Yes, it was quite the sight. No, not my cup of tea. I'm not sure, I've slept since then. The Hale-Bopp Comet is now beyond the orbit of Uranus but is still visible by large telescope, and will be until about 2020. After that, it is not expected to make a return for another 2400 years. 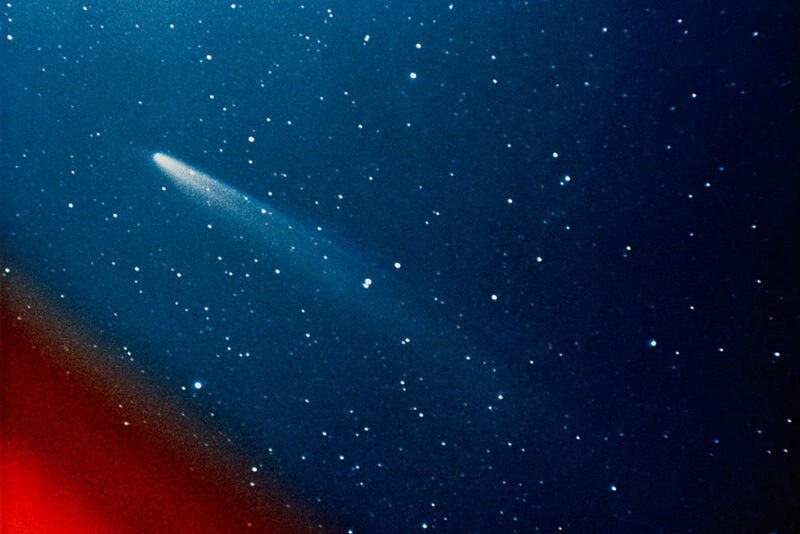 In early March 1996, Comet Hyakutake first became visible to the naked eye. By the middle of March, the comet was still relatively faint, but as it neared its closest distance to Earth, it quickly became brighter, and its tail grew greatly in length. By the end of March, Hyakutake was one of the brightest night sky objects, taking on a greenish-blue color. On the 25th of March the Hyakutake would be at its closest point to Earth. The comet was moving so quickly across the night sky that its motion could be seen against the stars in just a matter of minutes; it moved the diameter of a full moon about every half-hour. The head of the comet was a greenish hue, due to the diatomic carbon emissions. Hyakutake was only at its peak brightness for a few days. Because of this, the comet it did not have time to capture the public's attention in the way that Comet Hale-Bopp would the next year. Many people Europe were unable to see in comet at its best due to poor weather across the area during that period. 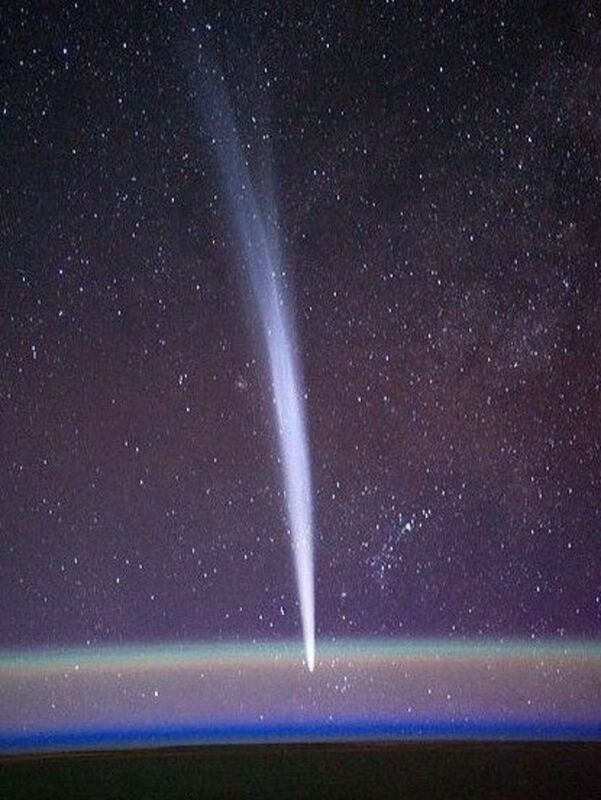 Comet Hyakutake, with the longest tail ever observed, will not return to our solar system for another 70,000 years. In the above Hubble Space Telescope photo, the dark blotches show scars from Comet Shoemaker-Levy 9 fragments that struck the surface of Jupiter. The 1993 Discovery of Comet Shoemaker-Levy 9 is credited to astronomers Eugene and Carolyn Shoemaker and David Levy. Soon after its discovery, it was found to be a fragmented comet and possessed a decaying orbit around Planet Jupiter. SL 9 became fragmented in 1992 when it orbited close enough to be ripped apart by the Planets' gravitational forces. The much anticipated impacts of the comet were witnessed between July 16, and July 22,1994. 21 impacts were observed over this period with the largest impact occurring on July 18, with a fragment causing a visible dark spot almost 9000 miles in diameter. This was the first time that astronomers had the good fortune to observe a collision of two space bodies. The size of the original, unbroken comet vary, with some scientists estimating that the comet was somewhere between three and seven miles wide, with the largest impacting fragment somewhere around one mile in diameter. Due to its potential collision with Earth, the Swift-Tuttle Comet has been described by many experts as the single most dangerous object known to humanity. The CST is on an orbit which puts it near to the Moon and the Earth. After its 1992 re-discovery, the comet's date of closest passage was miscalculated by 17 days. It was then noticed that, if its next visit (August 14, 2126) is also off by another 17 days, the comet would almost certainly strike the Moon or Earth. Given the size of Swift-Tuttle, this was quite alarming. This influenced astronomer Gary Kronk to look for ancient versions of the comet. He found the CST was probably seen by the Chinese in 69 BC and 188 AD. This information led scientists to recalculate its orbit, and deduce that Swift-Tuttle's orbit is very predictable, and that there is no impact threat over the next two milleniums. Astronomers feel that in the 2126 visit it will likely be a fantastic naked eye viewing opportunity, similar to the very bright Comet Hale-Bopp (1997). How many comets have you seen? None, I never look up. This photo shows the head-on collision of the Tempel 1 Comet and the Deep Impact probe. 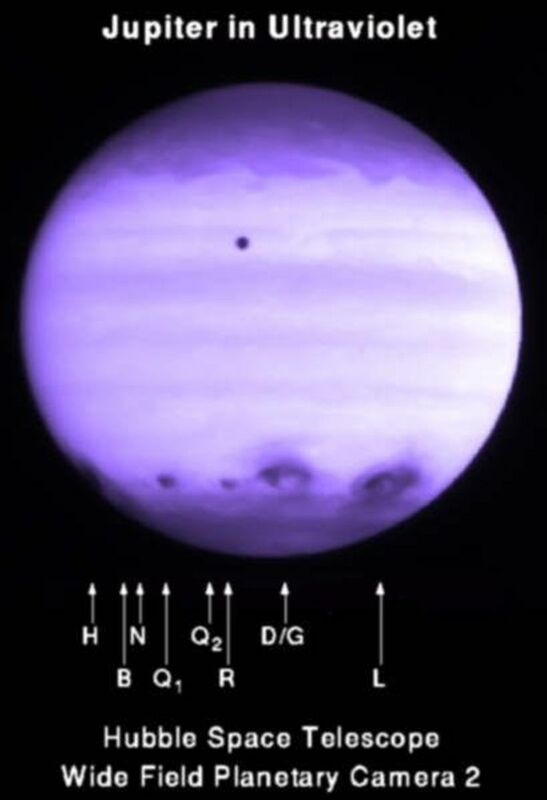 Tempel 1 was first discovered on April 3, 1867 by astronomer Wilhelm Tempel, an while he was working in France. At that time, the comet's orbit was just under 5.7 years, and the Tempel 1 was also successfully viewed in 1873 and 1879. The comet did not become visible in 1884/1885 and it was believed to have broken up and disintegrated. What astronomers in the late 1800s did not know is that Tempel1's orbit occasionally takes it close enough to Jupiter to affect it's orbit. It was not until 1967 when British astronomer Brian Marsden re-discovered the comet by recalculating the orbital path figuring in the influence of Jupiter's pull. Tempel 1 is a fairly dim comet; its peak brightness so far has been too faint to be seen by the naked eye. Its size is roughly to be 8.5 by 2.4 miles, these calculations are based on measurements gathered by the Hubble Space Telescope. 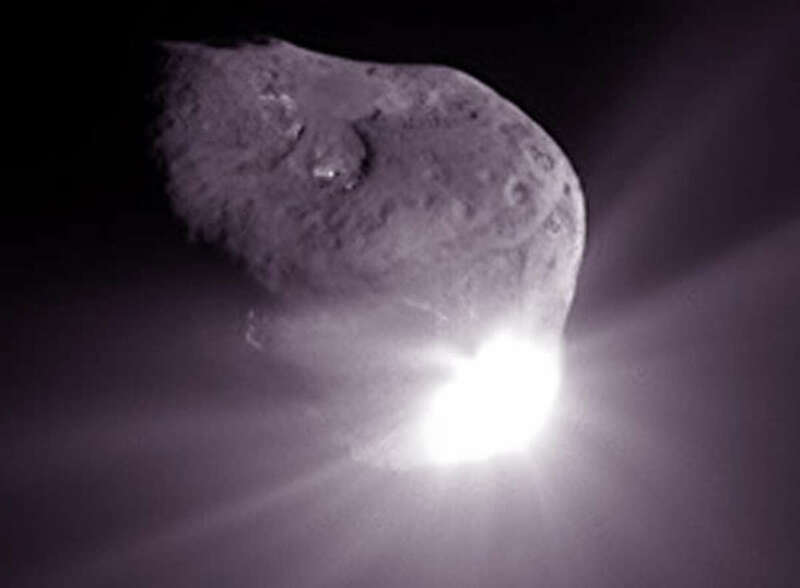 Comet Tempel 1 was the target for NASA's Deep Impact space mission, where on July 4, 2005, a space probe was deliberately impacted on the comet's surface to gather scientific data. The next time Tempel 1 returned (in early 2011), it was once again studied closely from space, this time via the existing Stardust probe. Tempel 1 was visited again in 2011 by the Stardust spacecraft. That was be the first time that a comet had been visited twice and was an opportunity to better observe the crater created by Deep Impact. Does a comet potentially colliding with the Earth concern you? Yes, it's a real threat. Nope, a collision is such a longshot. Thoughts on This Hub, or the Comets? - Feel free to comment here. Thanks for visiting. I like to star gaze. I have always been interested in science and have taught science for 33 years. very interesting. I didn't realize the number of comets that have been "in our neighborhood" in the past two decades. 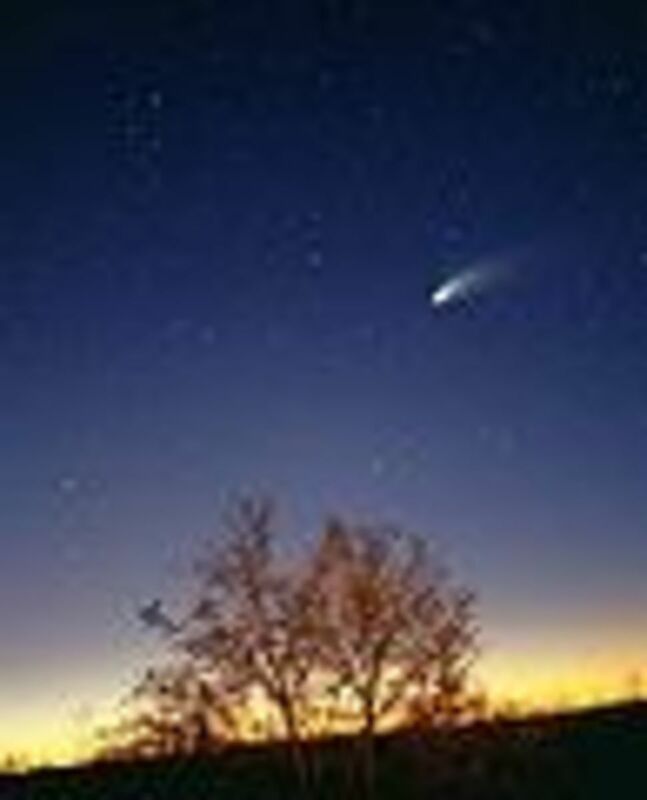 I was able to see Halley's Comet in 1986 (I was six years old), and one of the ones in the 90's, not sure which. I certainly remember what it looked like though. Thanks for all the information on comets. I really like this lens - thanks for building it. Tonight I am going to do my best to see Comet PanStarr, it only comes around every 100 thousand or 100 million years, I forget which (but you can find the info on space.com). It is not supposed to be so spectacular like some in the past, but it is something. Great lens. i especially enjoyed the videos and pictures. Returning with fresh angel dust....what an amazing presentation and complimented nicely with the SciFi theme! I love your valuable lens! Thanks a lot and Happy New Year! Great lens ! 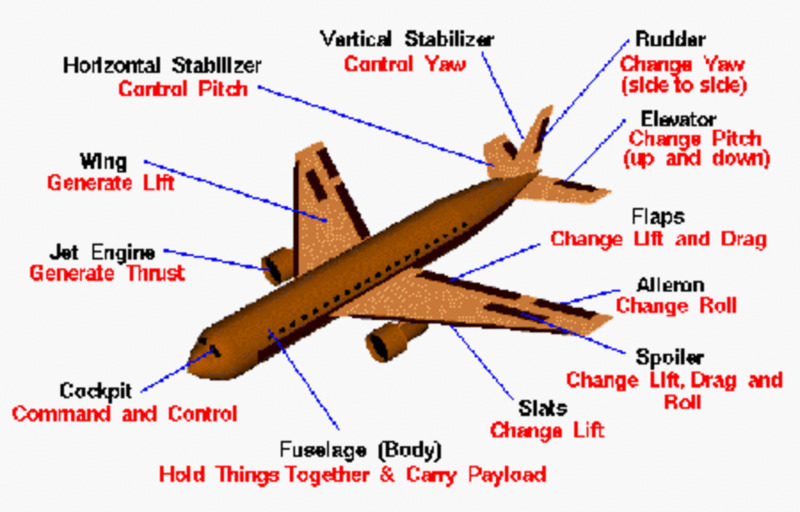 Useful and informative. Thanks for sharing. Really interesting Lens, I like the comets! I'd love to see a comet but I think you need a good telescope to really appreciate them. A very interesting lens, very informative. Fascinating subject - very thoroughly researched. Thanks. Wow what a lens! Very nice.. The background is very striking when the lens is loading and the pics, info and videos are great. Quility lens here.. I shared this with all my social media sites. Very cool.. 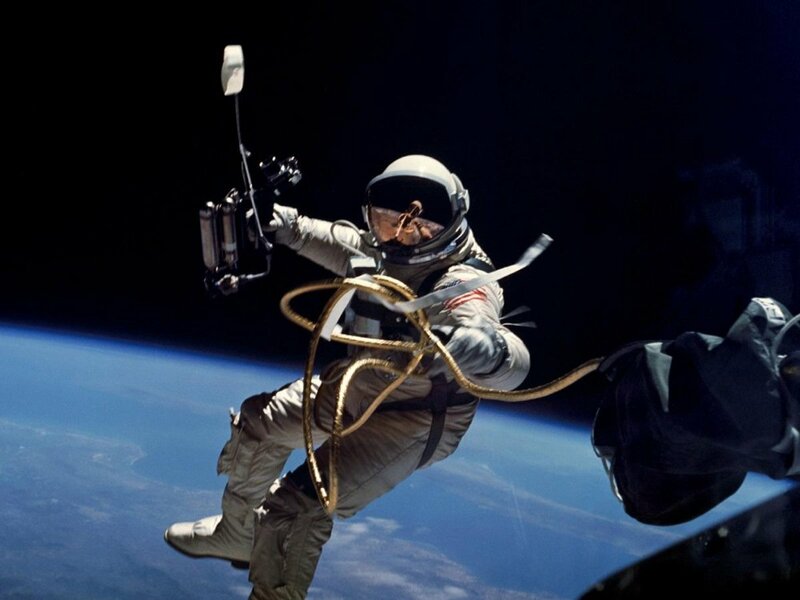 Anything related to space and outer world always excites me like anything. I enjoyed a lot reading your lens. Thanks for sharing such an wonderful lens. Very interesting and informative lens, if not a little unsettling. However I did enjoy all the beautiful pictures and videos and actually learned quite a bit. Thank you for all the time you dedicated to this lens. A truly fascinating read, indeed - thanks so much for sharing! Blessed by a space-loving SquidAngel! These are some amazing videos! Wonderful page. Blessed! Unnerving to consider that the energy of the Shoemaker Levy impact was 6 MILLION megatons. And we just defunded NASA (yay!). Such beautiful pictures. Makes me remember that there's so much more out there than what's going on in our little heads. Hi I enjoyed reading your lens, thanks for sharing. Blessed and added to my lens Squid Angel flinnie. Very informative lens. Excellent pictures, I really like your presentation. Fantastic, informative lens! I have featured this page on my space lens . Very well done! I am concerned about December 21st 2012. Any chances of a collision with one of them? I love learning about comets, and lets not forget that they also bring us beautiful meteor showers! 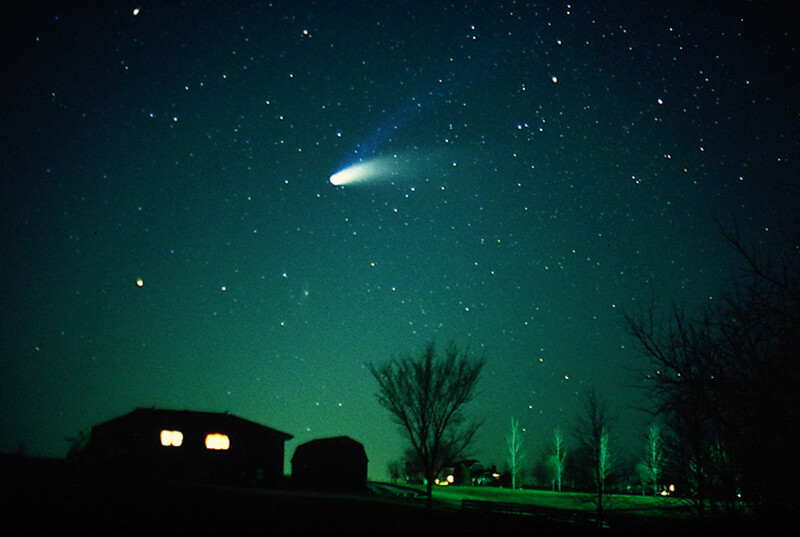 I loved watching comet Hale Bopp with my Dad -- it was a sight that I will never forget. Thanks for sharing, outstanding lens! Great lens. Strange that Hale and Bopp did not fight over who saw the comet first, who really discovered it. These days people fight over EVERYTHING. Nice work. Wow!!!!! I am completely blown away by this lens. Great job! Beautiful images and videos, beautiful lens! Interesting lens as I have been staring at the night sky for as long as I can remember. I wonder if any new, spectacular comets are in store for naked-eye viewing soon? Thanks for this interesting lens. Fascinating article on commets. Thank you for publishing it. 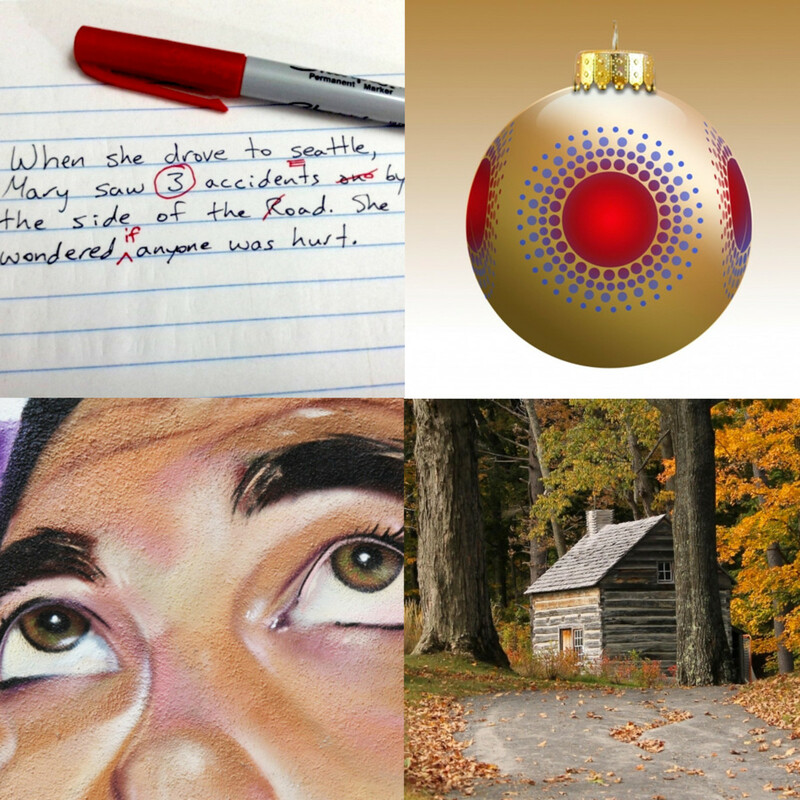 A very educational lens - great job, enjoyed the videos. What a thrill to see this beauty on the front page! I remember seeing Haleys comet in the 1980s, but I do nor remember seeing any of these ones! Great job and love the new theme! What a beautiful and well done lens. Blessed. An excellent and well written presentation of the five comets of the last 20 years and made even more spectacular with the new Sci-Fi theme, excellent and blessed! Great resource, thanks. I'll have to share this with my kids when we study space. Your pictures and info are superb. Wow, what a fascinating lens! Thanks so much for sharing. Blessed! Very original lens topic! Well done! I love you lens - well done. Good lens, very informative and well written, thanks! I lay on the frosty ground and tried to find Hale Bopp with binoculars but unfortunately didn't succeed. I guess I needed someone on hand like you to show me. I enjoyed the lens. Love your information; you did a wonderful job on this lens. My dad was a sky-watcher, so I was raised looking for anything unusual. I remember all of us out on the back patio in the cold, stretched out in lawn lounge chairs all bundled up and watching falling stars. Important topic. Any utility of a Commet someday ? what if a big comet hits the earth? would it be zapped with laser guns? comet falling into the ocean will cause tsunamis. I am fascinated with comets and have seen several already. Once, back in college, I drove 8 hours just to see a passing comet in a huge telescope - it was so worth it! Good information and an awesome lense! Keep up the great work! 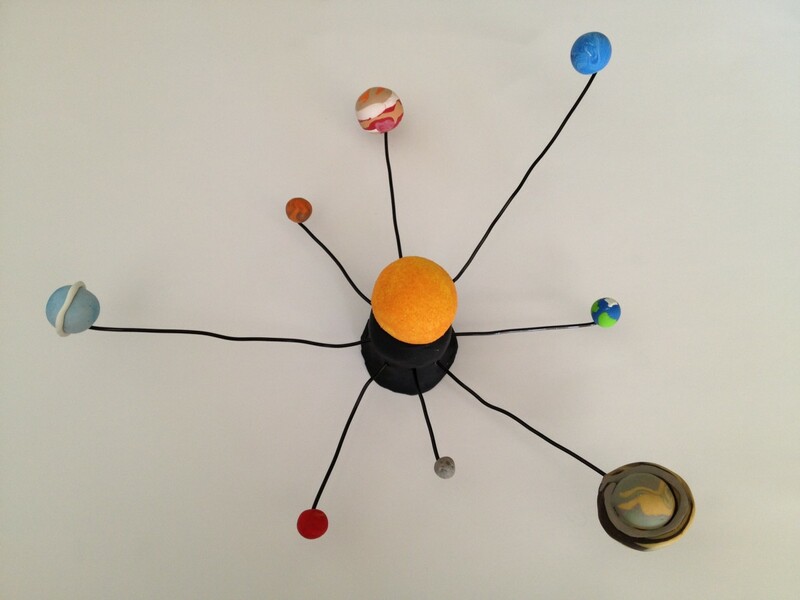 I have always been fascinated by the solar system; great work! Nice reminder. I must stock up my cellar!! A great, well researched lens. Comets are interesting as well as scary to me. Not specifically about Hale-Bopp, but I love looking at the sky, stars, and all the other things in space. I love comets I love anything that happens in the sky! Great lens! Froze myself over several nights back in 1997 trying to film this! Great lens, I love anything about space, shame that so many people are wrapped up in their lives that they don't even consider how vast the universe is! !